From the minute my alarm went off, I knew this day would be one I remembered for the rest of my life. This day might not have had the outcome I hoped for, but these twenty-four hours held unforgettable memories and taught me an important lesson. We had arrived in Orlando, Florida yesterday morning for the National Cheerleading Championship. Today was the day my coaches, my forty-seven brothers and sisters, and myself had been waiting and preparing for. Our team is stacked with talented athletes, and we are eager show everyone what we have been working on for only two months. Most teams come with routines they had been practicing for seven to eight months; we had a disadvantage because seven out of eleven of our boys were football players and could not practice in season. After an obstacle filled year, winning today was extremely important; however, showing others what Raider Pride is was more important. Today is the day, the day we had all been waiting for. I wake up to the ringing of my alarm, and immediately feel sick. One question keeps running through my head: “Will we be able to pull this off?” I am now getting out of my bed slowly, I wash my face, I brush my teeth and I begin to start my makeup. My eyes are so swollen from sleeping, I can barely apply my eyeshadow. Ashtyn, Caroline, Caity, and me in the room, and we are silent. Anyone could have felt the stress that engulfed the room; it was competition day. I hear my other teammates footsteps and voices as they are walking up and down the hallway, frantically getting ready. As I continue making progress in my appearance, Allie, one of our five amazing coaches, walks into the room to hand us our tattoos and ribbon. She asks us “Are y’all ready?” Am I ready? Allie leaves to deliver more R’s and ribbons to other girls. As she walks out the door, I push this question out of my head to focus on being ready to go at nine o’clock. Ella comes into my room to braid my hair, and now I am ready to put my uniform on. Before putting my shell on top, I look down at the R that I will soon be wearing. I make a promise in this moment that no matter what the outcome of today is, I will wear that R with pride. I grab a granola bar, and we are out the door. I see one of the boys with the speaker, and in the blink of an eye we load the bus and begin the day. We arrive at ESPN Wide World of Sports Complex, and we walk into the arena. As I look down at the mat I soon will be competing on, I start to feel sick again. All I can think about is about messing up. My team and I walk outside before warm-ups, and we get into our circle, listen to motivational words, and pray. The time has come, I am ready to go and perform. We take our team picture and begin to stretch. I just heard one of the staff members tell us our time starts now. I am starting to warm-up all my stunts when I hear “I’m from Louisiana” start playing over the speakers. I look over and see one of my coaches smiling as my whole team gets excited. We are going through the routine, and I am starting to get butterflies in my stomach again. Before the time is up, my team and I come together to say our prayer. We break on “Raiders,” and now it is time to compete. As I walk down the stairs I am starting to feel faint, and I distance myself from the group. I am standing behind the curtains with my eyes closed when I hear “Next up from Metairie, Louisiana, Archbishop Rummel.” I begin running out, behind the curtains are thousands of people yelling and bright lights shining in my eyes. I am now standing in my place, breathing in and out, and waiting for the music to begin. The adrenaline kicks in once I hear the music start, and I start the beginning pyramid. I am going through the routine, and then the most difficult part is approaching. I set and jump back into the backhandspring; I hit the stunt. I look out in front of me and see my coaches and other teammates jumping and clapping with excitement. In this moment, I realize that everyone else had hit their stunts too. Filled with excitement and joy, I walk up to my next formation. Tears stream down my face as I finish this near perfect routine; I look out at our parents, teammates, and coaches rooting for us. 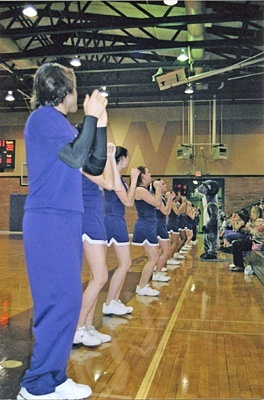 At the end, the music stops as we yell “Go Raiders.” I come down from my stunt, and leap into my stunt partners arms. I squeeze him as tight as I can as he swings me around. I knew this feeling could never be recreated, and I knew the feeling would be something I cherished for the rest of my life. We hit our perfect routine, and we achieved our goal. No matter the outcome, no one could take this feeling away from my teammates and me. Awards are beginning; therefore, I take a seat on the ground with my team and the other teams we are competing against. I start to feel confident in the outcome, but there is still this odd feeling in my stomach. They begin calling the top eleven teams out of twenty one. I keep losing focus, and I wonder if we will finally win this year. Suddenly I hear the announcer say “the final two teams in the division, both have incredible talent.” I look up and see us on the giant screens, all leaning over holding hands. The announcer says “In second place,” he pauses, then continues with “Archbishop Rummel.” I feel my heart being ripped out my chest as I fall to the ground in tears. After all the effort and work, we should have been champions. Awards finally finish, and I walk out the arena with my heartbroken team. I am sobbing uncontrollably, everything I have worked for this year was for nothing. I listen to a few people talk, but I do not hear what they are saying. The whole time I think about how we did not win; for a second I had forgotten all about the feeling I had after completing the routine. We make our way to the busses, but on the way there is when I learned something really important. People kept approaching us and all I heard was “you guys should have won” or “you were phenomenal.” For the first time since awards I felt proud, and I knew that we were truly winners. Despite the ending of this almost perfect day, I knew we were champions, and everyone knew what Raider Pride was when we walked off the mat. This was based off of my experience at Nationals this year. I hope people enjoy seeing things from a different view.